In this issue, we get to know Familie Johanneshof Reinisch of the Thermenregion of Austria. A brief 30-minute drive south of Vienna will bring you to the small town of Tattendorf and to the door of Familie Johanneshof Reinisch. 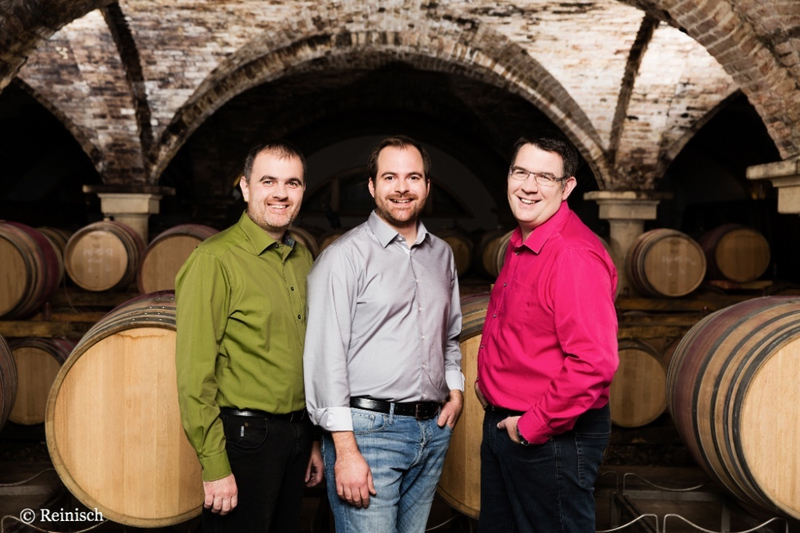 Located in Austria’s historic Thermenregion, the Reinisch family is producing wine in the fourth generation with the current winemaking team comprised of three brothers: Hannes, Christian and Michael. With a 2,000 year-old legacy of wine growing in the region, the Reinisch’s maintain Thermenregion traditions with vineyards planted to 65 % red and 35 % white vines. Best known for their excellent Pinot Noir and St. Laurent, there is a particular focus at Johanneshof Reinisch on the Burgundy varieties. 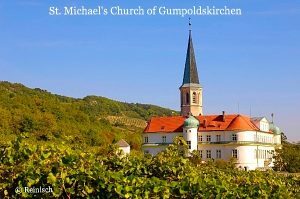 Their Pinot Noir vines grow in vineyards from both the stony, alluvial gravel soils of Tattendorf near the winery and the elevated, nutrient rich soils of the nearby village of Gumpoldskirchen. Traditions are held high for this family that tends its own vine nursery and local grapes in their Gumpoldskirchen vineyards where the indigenous grape varieties Rotgipfler and Zierfandler are cultivated. 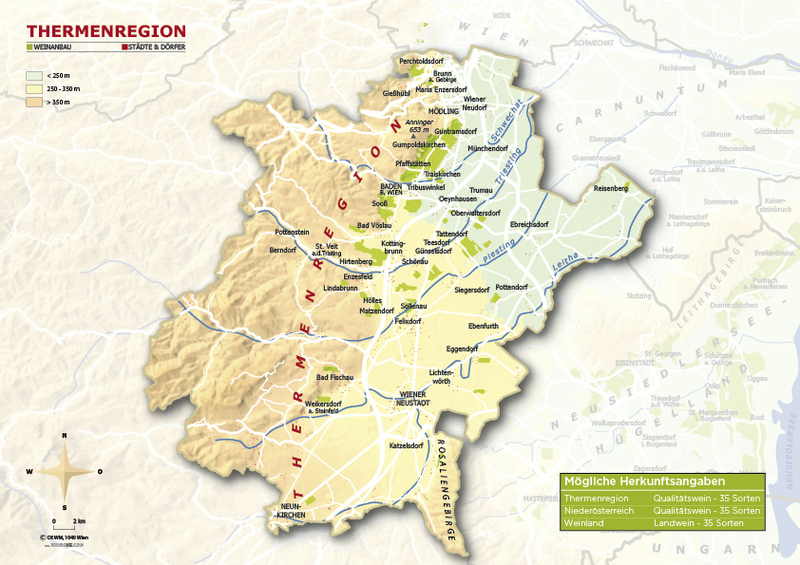 There are roughly 190 hectares (469 acres) remaining in the world of these two indigenous white varieties making the Reinisch’s offerings an unusual glimpse into Austria’s wine roots. The Reinisch family farms organically and takes their thoughtful approach from vineyard to cellar to bottle. The Thermenregion acquired this name, in part, from geothermal hot springs that flow under the vineyards here, contributing to favorable wine growing conditions for finicky varieties like Pinot Noir. Benefiting from nearly 2,000 hours of sun and the influence of the Pannonian climate, hot summers and dry autumns, grapes grown here attain optimal ripeness. The endless circulation of air from the northern hills and the eastern plain rapidly dries the grapes after precipitation, preventing the formation of mold. The region’s unique soil composition, set apart by brown earth, alluvial gravel and conglomerates, provides ideal growing conditions for high-quality wine grapes. Burgundy varieties thrive in the vineyards of Tattendorf. The thermal fault line running from south to north is where an ancient sea has left its remains. The coarse washed up material, or “alluvial gravel,” gets deposited into the stony “Tattendorfer Steinfeld”. The nutrient-rich soil of Gumpoldskirchen is exceptional for growing Zierfandler and Rotgipfler. Reaching 400 meters in elevation, Zierfandler and Rotgipfler grapes are only grown in and around Gumpoldskirchen due to the excellence in conditions. Rotgipfler is an indigenous Austrian white wine and is a regional specialty. Grown on the south-facing slopes of Gumpoldskirchen, the grapes retain sophistication and power. The vinification in stainless steel tanks results in exotic fruit and banana fragrances in the nose. The long and vibrant finish completes the expressive fruit on the palate. Found on the same slopes as Rotgipfler, Zierfandler is another regional specialty. This red variety also retains sophistication and power through proper nurturing and expresses a nutty wine with an alluring blend of woodsmoke and citrus. The outstanding acidity delivers spicy, relatively soy sauce like savoriness as the focal point. Reinisch’s St. Laurent grapes can be found in similar terriors to their Pinot Noir fruit. St. Laurent tends to ripen 1-2 weeks earlier than Pinot Noir around the time of the Feast Day of St. Lawrence, (August 10th) the festival from which the grapes are named. Similar to Pinot Noir, St. Laurent grapes are vinified in stainless steel and sees varying degree of barrel aging depending on the cuvee. The Reinisch brothers have recently begun several projects both in the vineyards and at the winery itself. The first endeavor is the rebuilding of old terraces in the Satzing vineyard situated in the historic winemaking village of Gumpoldskirchen. 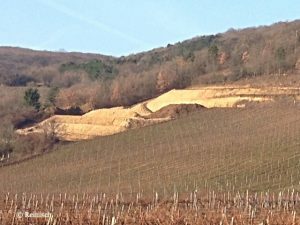 Located at 370 meters above sea level, the hill has an ideal exposition of south, southeast with soil consisting of limestone and brown earth conglomerate, conditions ideal for growing Rotgipfler. The reconstruction of the hill has just begun with plans to plant a cover crop in the upcoming spring. They will use cuttings from the oldest vineyards of Rotgipfler to plant their newest vineyard within the next several years. The Johanneshof Reinisch winery, “Im Weingarten” or “In the Vineyards,” was built in 1995. After 20 years, the brothers thought it was a good time for a facelift. Welcoming countless visitors throughout the year has always been a pleasure for the family and the addition of a video wall along with renovations to the tasting areas will guarantee a great experience for many years to come. The reconstruction is currently in progress with an estimated completion at the end of February 2016. 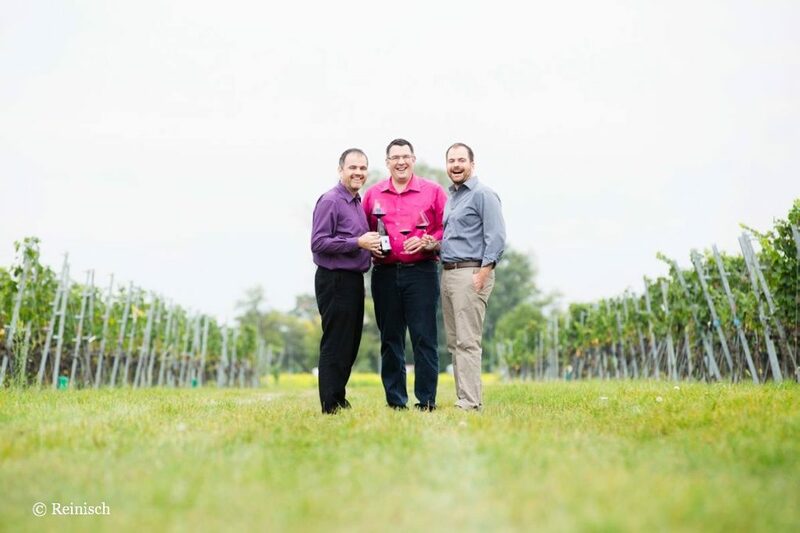 Atypical to many family-run operations in Austria, where often the eldest is granted the rights to the winery, the Reinisch brothers share all the responsibilities. The Familie Reinisch team is made up of three brothers, Hannes, Christian, and Michael. Hannes, the oldest of the brothers, has been responsible for the cellar since 1997. He is known for being very innovative and always developing new projects. When it comes to wine drinking, St. Laurent is the varietal in which Hannes prefers most, enjoying the characters of this unique red varietal. Christian, the middle brother, takes care of the vineyards and their Austrian customers. He is known for being warm-hearted and intuitive to what the vineyards need. When it comes to drinking wine, Christian’s sweetheart is his Zweigelt, which he makes from his own parcel in the Frauenfeld vineyard in Tattendorf. Michael, the youngest, is responsible for the office, sales and export of their wines. The family exports nearly 35% of their wines to 17 different countries. Michael is known for being down-to-earth, exact and having a good feeling for numbers. His wine drinking devotion is dedicated to the local white wine varietal Rotgipfler. He enjoys the expressive fruit flavors of this varietal. Prior to the summer of 2009, the year ideas for founding Circo Vino started to take shape, I knew very little about the Thermenregion. I was introduced to the area by winemaker, Fred Loimer, through his Schellmann wines. I had done some reading about the history of the Thermenregion and knew about the famed thermal hot springs in the area. Yet, even though this idyllic growing region is only 30 minutes south of Vienna, I had never visited. I visited Familie Reinisch for the first time in July 2009 and it was a perfect day. The weather was beautiful and I was excited by the prospects of learning something new about Austria and the possibility of finding a new gem for our nascent portfolio. In these first meetings with wineries, everyone is on their best behavior and it is essentially a mutual interview process, an assessment of enthusiasm, quality, commitment and personal fit while walking the vineyards, tasting wines and breaking bread together. From my perspective, our first meeting was ideal. The vineyards were unexpectedly wonderful and diverse. The Reinisch farming philosophy was above and beyond sensitive. The wines tasted delicious. We had lunch made by Mother and Grandmother while sitting outside in a peaceful picnic area. Even the family dog was at ease and enjoying. I felt in my gut that this would be a great collaboration. The enjoyment of wine is so much about moments like these when you can relax into the process of discovering. As one of the founding Winery Partners in Circo Vino’s portfolio, I am happy to say that Familie Reinisch continues to inspire ideal moments in my wine life. Whether it has been looking at historic organs in a Gumpoldskirchen church with Hannes Reinisch or riding in a vintage tractor through the growing region during a freezing cold June or drinking Rotgipfler from the bottle while on a hike in the wilderness or enjoying St. Laurent with my family during mealtime, the wines of Reinisch have enriched my palate and my life. I feel that the wines carry with them a certain togetherness and solidity that mirrors the collaborative, family spirit in which they are made. The are full of integrity and also fun, both the family and the wines.